- Any CAD, GBP weakness is a buying opportunity says Morgan Stanley. - Oil prices to recover further, BoC turn hawkish again, hurting USD/CAD. - 11% upside for GBP/CAD as MPs support May's EU customs union bid. The Canadian Dollar could be in for some modest losses over the coming weeks and months but analysts at Morgan Stanley are arguing that such weakness should be used as a buying opportunity because the Loonie will return to its 2018 highs before long. Canada's currency is already the second best performing currency in the G10 league table for 2019, thanks largely to a recovery in oil prices, despite the Bank of Canada (BoC) having all but abandoned its interest rate hiking cycle. But Morgan Stanley says it could still have a lot further to go, with as much as 4.5% downside still to come for the USD/CAD rate before year-end, as the Canadian Dollar is likely to enjoy significant support from a further recovery in the price of oil. However, and on the downside, the Loonie is still expected to play second-fiddle to the G10 universe's best performer for 2019. Sterling is set to recover notably from its Brexit losses this year, which is forecast to push the Pound-to-Canadian-Dollar rate nearly 11% higher. Morgan Stanley has recommended that clients sell the USD/CAD rate when it next touches 1.35, which is the same thing as buying the Canadian Dollar. "We look to sell USD/CAD at a more attractive level. The outlook for crude oil continues to be positive as OPEC+ supply cuts continue to impact the market and global demand rises. A rebound in Chinese and European growth would support this further. We see Brent recovering to $75 which should pass through to higher Western Canada Select," says Hans Redeker, Morgan's head of FX strategy, in a recent note to clients. Oil is significant to the Loonie and economy because and its its derivatives make up the lion's share of Canada's exports, which are a key part of what underwrites the currency. And prices of oil have been highly volatile in recent months. The price of Brent crude, the global benchmark, fell more than 30% during the final quarter of 2018 due to investor concerns about the health of the global economy and speculation suggesting the Organization of Petroleum Exporting Countries (OPEC) might fail to "rebalance the market" in favour of higher prices. That plunge helped force the price of Canadian oil down to a record low and prompted the Alberta government to require production cuts of domestic producers in order to lift prices, all of which came at a cost to the economy. Catastrophe in the oil market and global growth fears with their roots in the U.S.-China trade war saw the Bank of Canada u-turn in December on earlier guidance that could have seen it lift Canadian interest rates three times this year, which hurt the Loonie. However, Morgan Stanley not only envisions a further recovery of oil prices this year, but also another u-turn from the BoC. It says higher oil prices could easily see the bank turn "hawkish" again. "The prospect for the BoC to turn its rhetoric more hawkish is increasing. Should global growth continue to stabilize and rebound, financial conditions stay loose, and US growth remain relatively supported, the BoC may once again discuss the need to get rates back to neutral. A risk to the trade is that global crude prices begin to fall, weighing on CAD," Redeker says. 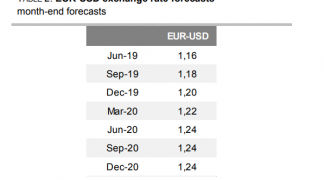 Redeker and the Morgan Stanley team have told clients they should target a fall to the 1.29 level for the USD/CAD rate once their trade is activated, although the bank forecasts the exchange rate to be even lower by year-end, at 1.28. 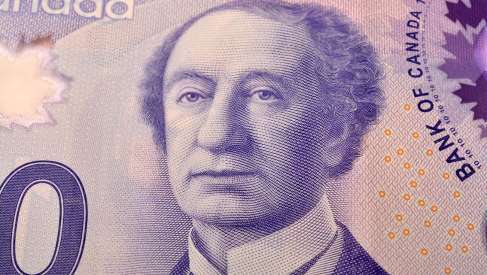 The Pound-to-Canadian-Dollar rate, on the other hand, is forecast to rise by a double-digit percentage this year as the UK parliament slowly but surely brings the Brexit saga closer toward an eventual end. "Any weakness should be limited due to the currency's undervaluation (~18%). Our base case of a customs union Brexit is looking increasingly likely with PM May's pivot from party to Parliament, suggesting current GBP valuations are attractive. Coupled with the risk of a no-deal Brexit remaining small, we would view any GBP dips as buying opportunities," Redeker says. Redeker says the best way for investors to exploit any recovery in the Pound over the coming months is by buying the Pound-to-Dollar rate, which is projected to rise from 1.31 to 1.52 by year-end. 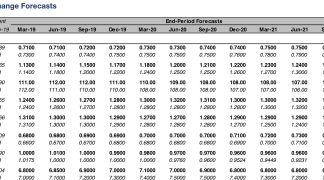 However, Morgan Stanley's GBP/USD and USD/CAD forecasts imply a near-11% gain for the Pound-to-Loonie rate this year. The Pound-to-Canadian-Dollar rate is, after all, a cross rate that is calculated at its most basic level by dividing GBP/USD over CAD/USD. That equation applied to Morgan Stanley's forecasts puts the Pound-to-Loonie rate all the way up at 1.94 by year-end, which is a level the market has not seen since well before the Brexit referendum.